Just when you thought Saturday could get no worse, up came the news that Jack Compton had scored a hat-trick. 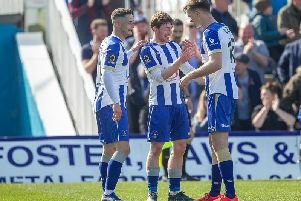 It was bad enough Hartlepool United had slipped that bit nearer to a relegation zone they thought they had left behind forever. But to be dragged closer to it by their gifted/erratic (delete as appropriate) ex-winger went beyond the pale. While Compton was bagging a treble at Wimbledon (one was a fluke, but hey, a hat-trick is a hat-trick), Pools were suffering another home defeat - number seven of the season. For those of us who had tried convincing ourselves that Pools were NOT in a real battle for survival, the realisation has now dawned. That, of course, was classic comedy. This playing out at Victoria Park is serious stuff. Very serious. Pools are four points from the drop zone. Yes, it’s the same figure as it was before but it is getting more crowded down there. York, who were looking ‘nailed on’ for the National League, beat Stevenage, while at Wimbledon, Yeovil were moving to within a point of Pools thanks to Compton’s ’trick against the Wombles. Newport, one place above Pools, even won, 2-1 at Morecambe. Of course, Pools have between two and three games in hand on their rivals, but they will only count if points are being picked up. Pools, worryingly, have dropped below the point where they have fewer points per games played - 25 matches, 24 points. Statistics can often be made to look like what you want them to look like, but if you removed the first 11 days of the season, it is 22 matches, 15 points. Your Monday analysist, I use that term loosely, has asked previously for the real Pools to stand up. Now it cannot be a request, it has to be an order. Pools are fluctuating from good to bad by the game and it cannot continue. Wycombe was good, Accrington was horrible, Cambridge was highly encouraging, now Exeter was a kick where it hurts most. There were bright moments, flashes of skill, invention. There were was some good football, not easy given the remnants of Storm Gertrude meant there was a fierce gale blowing across Victoria Park. However, there was one crucial thing missing: Goals. Yet, you would not have thought it given the whirlwind start made by Pool. Just like the previous Saturday at Cambridge, Pools raced out of the blocks and had all the early play and pressure. Rakish Bingham had a shot blocked and combined cleverly with Michael Woods, his flick putting the midfielder striding into the box. The situation cried out for him to pull the trigger but he seemed intent on dribbling his way through and Troy Brown nicked the ball off him. Jake Carroll sent over a teasing free-kick which deserved putting in but Lewis Hawkins could not get any real connection on it. There were bright moments and attacking intent but not where it mattered, in the away box. Exeter, it has to be said, were decidedly average. They left out their sought-after striker Tom Nichols and the Grecians offered little. But they scored a well-executed opener through Alex Nicholls to go in front against the run of play in the 36th minute. Exeter had been on the defennsive but broke forward and Lee Holmes sent over a fine cross from the left. Nicholls had got a yard on marker Scott Harrison – in for the injured Matthew Bates – and his eight-yard header just beat Trevor Carson’s despairing dive to his left. Pools, who could probably not believe they had fallen behind, then stuttered throug the remainder of the half with Jayden Stockley going just over the home bar with a neat shot on the turn. To the credit of the home side, they began the second half on the front foot and Harrison shot over from a corner. Pools missed a glorious chance on 51 minutes when Jake Gray played a delightful pass to Nathan Thomas. The winger, on as a first-half sub for the inured Rhys Oates, ran superbly into the box only to badly drag his left-foot shot wide of Bobby Olejnik’s left-hand post. Ronnie Moore made a double change on 65 minutes, bringing on Billy Paynter and Carl Magnay for Woods and Nicky Featherstone. The arrival of Paynter was no surprise though Magnay perhaps was. With Thomas slinging in crosses for fun, a goalscorer may have been a better option, but Scott Fenwick was left on the bench. Fenwick may not beat Usain Bolt to the bus-stop but can finish if the ball comes into the box. Thomas had another good chance when he volleyed wide from a Richards cross. Carroll was involved in two of the best closest opportunities. His free-kick was almost headed into his own net by Christian Ribiero and the left-back drew a diving stop from the keeper from his long-range 83rd-minute shot after a jinking run. It was the first shot Olejnik had to save. A minute later, the Grecians sealed the deal. Pools lost the ball in the centre-circle and Exeter found Nicholls. He got the better of Harrison and put over a teasing cross which Joel Grant converted via the underside of the bar. Pools appealed it had not crossed the line but the linesman judged otherwise and the goal was awarded. The hosts had a late throw of the dice with Thomas firing into the side-netting and Olejnik keeper tipping over a Magnay header, but it was too little and too late.